The robbery happened when two men broke in through the rear door of The Sea View, Preston Road at Whittle le Woods. Masked robbers armed with a knife and spade stabbed the landlord of a popular pub near Chorley in a "terrifying" raid, say police. The robbery happened at just before 2am today when two men broke in through the rear door of The Sea View, Preston Road at Whittle-le-Woods. 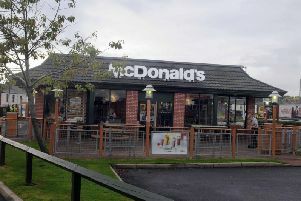 Detectives say the men, armed with a spade and a knife, were confronted by the licensee who was assaulted before the offenders made off, possibly in a vehicle, with an amount of cash. The licensee is said to have suffered some minor stab wounds and a black eye and was taken to hospital. A second member of staff, a woman, was also threatened but was not harmed physically. Police are now trying to trace the offenders and are appealing for the public to help track them down. The first offender is described as white, between 5’5 – 5’8, wearing a white Purge mask, a Canada Goose style jacket with a white logo on the outer side of the left upper sleeve, black gloves. He spoke with a weird voice as though to conceal his accent and he was armed with a spade. The second man was white male, between 5’5 – 5’8, wearing a black balaclava, black jacket. He spoke with a scouse accent and he was armed with the silver knife. Detective Sgt Ian Derbyshire, of Chorley CID, said: “This was a terrifying incident for the staff members involved with offenders clearly prepared to carry weapons and to use violence. "It is fortunate that the injuries sustained were relatively minor but these are dangerous offenders and we need to find them. Anyone with information should contact police on 101 quoting log number 0095 of Monday, December 18th or independent charity Crimestoppers on 0800 555 111.